Feature. Nu Sta Djunto, a movement based in greater Lisbon, was created in 2013, after the massive anti-austerity demonstrations of 2012. Following the principles of solidarity, unity and horizontality, Nu Sta Djunto steps in where the state fails. – It’s not a collective, it’s a movement, says Mário Monteiro, better known by his nickname Boss. He is defining Nu Sta Djunto, which means “we are together” in Cape Verdean Creole. We are in his kitchen in a neighbourhood called Boba, in the outskirts of Lisbon. From the window of the top floor apartment you can see both a basketball court and a shepherd herding his sheep. Most of the residents moved here from autoconstructed neighbourhoods that were demolished before the Euro 2004 football championship. A majority of them are of Cape Verdean descent, or Roma. – For me Nu Sta Djunto carries on the spirit of my neighbourhood Fontainhas, he says, referring to the spirit of mutual help and sense of community. He was 16 years old when the last houses were demolished in 2003 and the residents forced to leave. – The people were united, the doors were always open and you didn’t need to knock before entering your neighbour’s house, Boss describes. The principles of Nu Sta Djunto are solidarity, horizontality, unity and mutual help. The movement organises events, most of the times hiphop concerts with an educative component, where the visitors don’t pay an entry, but instead bring a donation of food, clothes, toys or hygiene products. Vegan food is also sold, and the profit is used to purchase more food or other goods. The goods are then distributed to those in need. The movement also receives donations outside events, such as furniture or household appliances. – We help where other forms of help don’t reach. 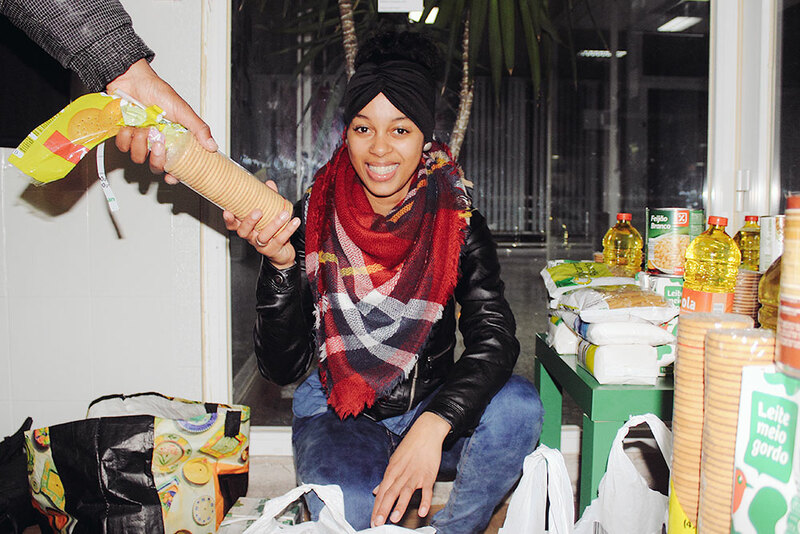 In the centre of Lisbon several organisations distribute foods, but they don’t work in the suburbs. The horizontality means that there is no distance between those being helped and those helping. – People who receive help often help too. You might need help with something and be able to help with something else, be it by baking a cake for us to sell, he says and illustrates the dynamics with a story of a Senegalese immigrant. He had managed to find a place to rent with a few other men, but didn’t have food or means to cook, since the flat was rented without furniture or appliances. Nu Sta Djunto was able to arrange them a used cooker and three bags of food. Boss managed to help him find a job too. – When we met after a while, he wanted to give Nu Sta Djunto some money. The same day I met a single mother who needed some urgent help, so we used the money to buy groceries with her. – I’ve needed help myself too, many times, he adds. 2012 was a year of massive demonstrations in Portugal. The biggest since the Revolution of Carnations of 1974 took place in September: a million people gathered to oppose the austerity measures linked to the economic crisis in over 30 different cities. – We too participated in demonstrations in Lisbon, but I felt that the activists were just saying what was wrong. So there is poverty? Ok. I asked how do we start eliminating it. Nu Sta Djunto became the way for Boss and other activists to reach out for those in need. When asked how many people are involved nowadays, he starts listing suburbs of Lisbon where the movement has organised events and provided aid. They are around 20. As in Boba, most of the other neighbourhoods too are inhabited by immigrants from the former Portuguese colonies in Africa and their descendants, as well as Roma people. There are also white Portuguese, especially those who moved to the capital area from the rural zones. These groups, already in vulnerable position, were hit hard by the consequences of the economic crisis in Portugal. Due to the unemployment the white Portuguese were now competing for the same jobs with the black population, such as construction work. Also, in the autoconstructed neighbourhoods there were more opportunities and flexibility: you could have a small café, work as a tailor or sell cakes. This changed after the relocation to suburbs such as Boba, Boss explains. In each neighbourhood there are various people who work with Nu Sta Djunto, from rappers to those who cook for the events or distribute goods. The movement also has activists in central Lisbon and in other Portuguese towns – and even in Brazil. – For me everyone who helps is part of the movement, like one brick in building something great, he says. The idea is not only to aid, but essentially to provide people in the suburbs with tools to follow the model, or create their own, in order to create funds and be self-sufficient. When an event is organised in any of the suburbs, the profit stays with the residents. The locals also help in distributing the aid. – When we go to the neighbourhoods, people show up to help in the distribution, and they also do the list of those in need, especially big families and single mothers, Boss describes. Nu Sta Djunto also receives requests for help from associations and organisations in situations where they cannot help further, and collaborates with like-minded projects. Boss tells that the movement has grown significantly in the past years. – You don’t motivate people by speaking. People are motivated by seeing the concrete work we do. The movement reaches out for the younger generations. As if to prove Boss’ point, a group of four teenage girls shows up for a surprise visit after school. One of them wants to organise an event in order to collect donations in her school and asks whether Boss could speak with the teachers. They had earlier heard Boss explaining the way Nu Sta Djunto works, and say that the possibility to help others made them want to get involved. But what impressed them the most was the event Nu Sta Djunto organised in Boba to celebrate the movement’s third anniversary. Regardless of the rainy and cold November weather on the third anniversary of Nu Sta Djunto, the atmosphere was excited. A stage had been set up in the corner of two big blocks of buildings. – That was the weekend the movement received more donations than ever. The people are used to helping each other in the suburbs, Boss describes. People also came from far to bring their contributions, such as toys, clothes and food. – The elderly told me aftewards that it was the greatest party since they had moved to Boba from their previous neighbourhoods. The events always create a great sense of unity. As in all Nu Sta Djunto events, there were activities for children. An artist, Di Jah, gave them an art workshop. Some of the activists cooked vegan food, while the local ladies had prepared cachupa, a traditional Cape Verdean dish. The programme included concerts of Cape Verdean music styles batuque and funaná, as well as a reggae concert, and several rap performances. – Our idea is to show where rap came from and give space to up-coming groups, Boss explains. He criticises rap that offends women and says that the movement supports artists that transmit an educative message – that of unity, equality, respect and solidarity. Boss himself is a rapper too, who transmits the values of the movement in his music. When he finally got on the stage, all the kids in the event ran to surround him, singing along to his lyrics. While for many Boss is the face of the movement, he underlines horizontality and the contributions of everyone involved – donors, those who organise workshops for the kids, those who cook, those who work with distributions and organise the events. But one person in particular has been around since the beginning: his sister Débora Monteiro. She has just come home from work and joins the conversation for a moment before going to pick up her son from the nursery. – I do a bit of everything: cooking, serving food, singing in the concerts and participating in distributing food, Débora describes. – Things go well when she is present, Boss adds. As we prepare for a distribution, it is Débora who counts the goods: milk, pasta, beans, salt, rice, oil and bisquits for 20 bags of food. We carry the goods to the car of a friend and head to Barreiro, a small town close to Lisbon and Setúbal. There Rasta Mula waits for Nu Sta Djunto in his Ras Café. He has previously listed families of the local community that would benefit most from the aid and goes to call them from their homes. Boss makes sure that everyone leaves the café not only with food, but with knowledge of Nu Sta Djunto and its principles. He doesn’t want people just to receive the food – the delivery is also a form of strengthening the principles of the movement and calling more people to join. Rasta Mula follows the distribution behind the counter and tells that he has known Boss for many years. It is the first time Nu Sta Djunto makes a distribution in his café. The café serving vegan food was opened two months ago, and the idea is to create jobs for the community, he tells. During the delivery it comes up that an elderly lady is not on the list together with the rest of her family. Since she lives alone, a bag of food is arranged for her as well. She leaves giving blessings to Boss, but turns around after a while. She asks Boss to help her carry the bag downstairs, calling him her son. Rasta Mula and Boss agree that they will do another distribution soon, and bring toys and childrens’ clothing together with food. As we drive back to Lisbon, Linda, who participated in a distribution for the first time, says that it was a good experience, and will join again anytime when possible. – I don’t even dare to tell what my plans for Nu Sta Djunto are! Boss says and tells that many times he is told that he has too big plans. But the movement keeps on proving the sceptics wrong. He has just gotten good news regarding a space for the movement, and there are plans to open a nursery, a community canteen and a space for concerts and events, a library and a studio, together with other like-minded groups and individuals. Some of the goods for the kitchen will be bought from people who have informal garden plots in the surroundings of their neighbourhoods. – I’m not interested in creating new things, I wan’t to strenghten the existing structures, he says and wants the children to visit the gardens regularly to learn from the cultivators, creating space for intergenerational learning. In the future there will be a fund for students, in order to help more youth of the marginalised communities to have access to higher education. – Nu Sta Djunto is going to continue strong, Débora continues. She tells that her son, 4-year old David, and Boss’ daughter, 6-year old Yasmin are always present in the events. – They are also eager to help when we are preparing the bags for delivery, and get upset if we do anything without them, Boss adds. His daughter had spoken so much about the movement in her nursery that they ended up inviting Boss to speak about the project there. – We don’t work in the movement for ourselves, it is for our children, for the younger generations, Boss describes. But how do they, both working full time, find time and energy for the movement? – I might sleep little, but it’s enough, Boss says and Débora agrees. He explains that it is important to value what you have, and the fact that you have means to help. – It’s a lifestyle, not an obligation, he concludes.